When people think of snow; they probably envision sledding, snowball fights, and curling up in front of the fireplace with some hot chocolate until the storm passes. But sometimes, the weather can be so unpredictable. A flurry of snow can instantly turn into a devastating blizzard; leaving buildings destroyed, immobilizing cities, and claiming many lives. Let’s take a look back at a few of the worst blizzards in U.S. History. 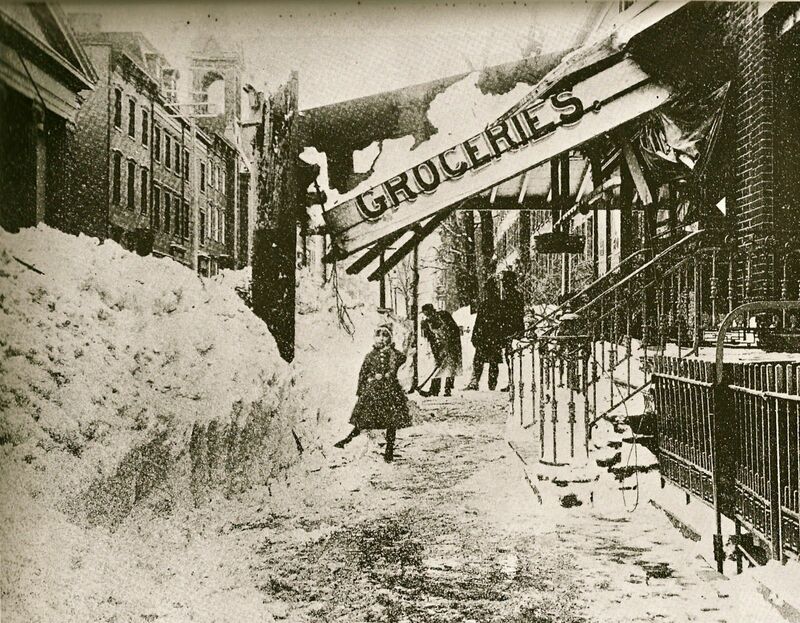 In 1888, a blizzard swept through Massachusetts, Connecticut, New Jersey, and New York. 40-50 inches of snow blanketed the states, resulting in more than 400 deaths – the highest death toll recorded for a winter storm in American history. The Great White Hurricane, also known as The Great Blizzard, buried homes, cars, and trains. As temperatures plunged, high-speed winds covered the East Coast and sunk 200 ships. On January 26th, residents in Chicago expected just 4 inches of snow. But instead, they were greeted with over 23 inches that spread across Northeast Illinois and Northwest Indiana. It was the largest snowfall in Chicago history, leaving 50,000 cars abandoned and 800 city buses scattered throughout the streets. Residents saw their 35-minute commute turn into a 4-hour trip when the roads became impassable. Southern states may get a bit of snow here and there, but they’re never truly ready for the type of blizzard that primarily hits the upper Midwest and the Great Plains. However, in February 1899; Florida, Louisiana, and Washington D.C. were hit by a cold wave that later became known as The Great Arctic Outbreak. The bitter, chilly temperatures dropped to alarming rates across the country, with D.C. recording a low of −8°F. By the time the blizzard had passed, 30 inches of snow was recorded, and over 100 people lost their lives. New England spent its Thanksgiving holiday in 1950 dealing with winds, heavy rains, and 57 inches of snow. The half-blizzard, half-hurricane was deemed “meteorologically unique” by the National Oceanic and Atmospheric Administration because of its record high and low temperatures. As the Arctic front made its way through Ohio, coastal flooding occurred, and the Appalachians were blanketed in heavy snow. In total, the blizzard was responsible for 353 deaths. With winds reaching over 60 miles per hour, the Great Lakes region of the U.S.A. experienced its most destructive and deadliest storm to date. On November 7, the extratropical cyclone produced hurricane-force winds that were fueled by the lakes’ warm waters. 250 people died and dozens of ships sank in the lakes. Although it’s called The Blizzard of 1996, it wasn’t technically a blizzard. Instead, this storm started when cold air from Canada collided with the warm winds from the Gulf. On January 6, snow hit the D.C. and Baltimore areas, and before it let it up, it had already deposited 30 inches of snow. In total 154 lives were lost, mainly due to car accidents. A blizzard/cyclone hybrid wrecked havoc on March 12, 1993. People from Canada all the way to Cuba had a few days notice about the impending storm. Thanks to the pre-warnings, many lives were saved. But this massive blizzard caused governors to declare a state of emergency, and over 26 U.S. states were affected. Several feet of snow was dumped in areas, such as Florida. In the end, there was an estimated $6-$10 billion worth of damage and 300 deaths. Three feet of snow fell over the span of two days in January 1922. Pennsylvania, Washington D.C., Maryland, and Virginia were hit the hardest. Buildings were completely destroyed, including the legendary Knickerbocker Theater in D.C. Sadly, 98 lives were lost. On November 11, 1940, previously known as Armistice Day, it was a pleasant day with a few clouds in the sky. Suddenly, it started to rain, which later turned into snow. More than 16 inches were recorded in Minneapolis, catching many people off guard and claiming 49 lives. A group of duck hunters were also found deceased after getting trapped in a remote area of land when the blizzard swept through Mississippi. One of the most devastating blizzards occurred on January 12, 1888. The day started out rather warm until the temperature suddenly dropped a few degrees above freezing with a windchill of minus 40 in North Dakota. Children were sent home early since they weren’t prepared for the freezing temperatures, but sadly, many of them didn’t make it. 235 people died, many of them children in the Northwest Plains region of the U.S.
Video: New York Street Knowledge!